- Carfree Day was two weeks ago, but one downtown Silver Spring resident is keeping it up - for a month, at least. Friend of JUTP/former coworker Chad Bolt has started a blog, One Month. One Guy. No Car. documenting his attempts to get around without a car for thirty days. Luckily for Chad, he's got a free Ride-On pass, a bike and actually enjoys running. Here's hoping Chad will want to continue his experiment after the month is over. - Friend of JUTP and awesome filmmaker Walter Gottlieb asked us to mention his latest project - he and his daughter Arielle will appear in Stroyka Theatre's production of the thriller The Bad Seed, based on the 1954 novel by William March. (It was also made into a movie, which I vaguely remember seeing on TV one lazy Saturday afternoon before my family had cable.) Arielle plays Rhoda, the title character and protagonist, while Walter plays her father, Colonel Kenneth Penmark. The show opens on Friday, October 8 at 8pm at the Burke Theatre in downtown D.C. For more information, check out their website. - Historian 4 Hire David Rotenstein tells us that a Four Corners home built for the 1939 World's Fair will be featured in a new exhibit at the National Building Museum; meanwhile, he and the rest of Montgomery County's Historic Preservation Commission are trying to explain how the county spent $2 million on a house that isn't really Uncle Tom's Cabin. - TBD says that there's no construction date set for a skatepark in Takoma Park. 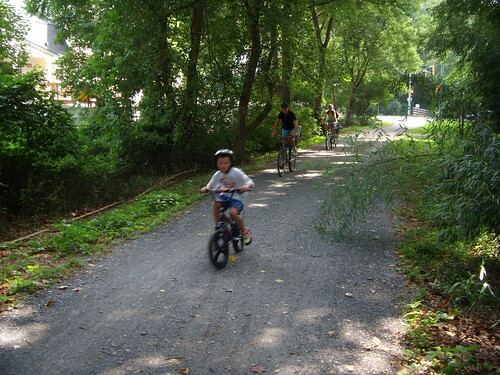 - Neighbors of Lake Frank in Rockville (hey, it's still in Council District 4, just like Burtonsville and Kemp Mill) are complaining about a proposed trail behind their houses. Boy, imagine how upset they'd be if they wanted to run a train back there! Oh, wait . . . Thanks for the mention. About the un-Uncle Tom's Cabin: I am a former HPC commissioner. I hope Philly's treating you well. Have you found Koch's yet?